You must make reservations at least 5 minutes in advance of the time at Ferro Bar & Cafe. Ferro has been established and family-operated since 1993. The Space: Originally a billiard hall of colourful yet dubious character which endured for over 20 years, the Pronesti family took possession over two decades ago and added eclectic yet tasteful elements of industrial, avant-garde design while maintaining the vibrancy and creative energy of the original space. 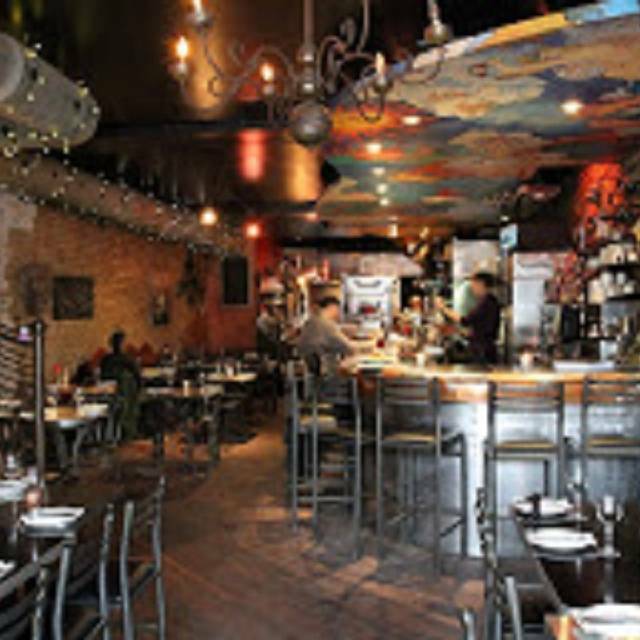 The Food: Serving up traditional southern Italian cuisine with a creative spin where we feel you will enjoy it! Our original culinary ambitions have never changed: By holding true to the family recipes and dedication to fresh ingredients as passed down through the generations that have preceded us, we bring you authentic, honest, home-cooked food the very same way we enjoy it. A platter including the Magic Mushrooms, Bruschetta & Crostino of the day. 6 pieces - great to share! +$1.50; Turn any pizza into a large folded over crescent, filled with all the same ingredients, that will challenge your appetite! We really enjoyed the pizza and pasta dishes - flavors were fantastic. Will be back! Great food and service. Always consistent. My favourite Italian restaurant. The food was amazing -- highly recommend the pasta. Unfortunately, our dessert orders were forgotten and my take-out was mislaid for about an hour, but otherwise it was a great experience. (And they did comp the desserts, which was appreciated!) Have eaten there before with no issues, so maybe it was just an off night. Either way, the delicious dishes made it worth it! Would recommend and return. Food was decent. Although we felt like we were rushed out at the end. We were still eating/drinking and suddenly servers kept trying to pack up our food that we hadn't finished yet. Music was a bit loud. Servers missed a few people's meals or offering peppers/cheese, etc. The food was delicious... and the service was great!! I would highly recommend this restaurant if you enjoy Italian cuisine their pizza is excellent and we also enjoy their seafood pasta! Good food and generous portions. Service was not super attentive, but I have a sense that they may have just been short staffed that day. Excellent service and food. We had a mini engagement dinner here and the staff was super attentive and fantastic. Also the food was incredible! The eggplant parmigiana was super good and the wodfire pizzas are excellent. Amazing food! Although it was New Year’s Eve, we did not feel rushed. Service was great. Will return! Must order magic mushrooms. They’re life changing! Our waitress was amazing also! Can’t wait to go back again and again and again! Cousin and I went for lunch just before Christmas. The interior was very inviting and warm looking. Our waiter was friendly and very helpful. We had magic mushrooms, gnocci (sp?) and zupa di pesci. All excellent along with complimentary bread and olive oil, parmesan, balsamc dip. I had a glass of Proscecco. We sat near the door with only a thin wall between us and the area next door which is under construction. Power saws made a horrific noise and construction guys walked through noisily yelling out to each other. Definitely very off putting. Final opinion? Food excellent! Ambiance sucked eggs big time. Great Food. Great service. The atmosphere is friendly and the food is tasty. Attention to detail is not a second thought. Price is fantastic too! Wonderful ambiance, excellent food, warm service. Never disappointed here. Awesome restaurant. Awesome service. Awesome people who work at Ferro. Loved the ambiance and the food! Was in Rome, Sicily and Capri in September and Ferro was just as lovely as our favourite restaurant in Rome. Best dining experience ever! Strongly recommend. Definitely will return! We had 19 people and the waitress was excellent. We were quite noisy and the staff was more than polite. Food was excellent! We go to Ferro often and have always been more than pleased with everything. The food was ok. Little too nosiey so we couldn't talk to each other. Plus it was quit hot inside but it was very hot outside as well. We went for the prix fixe menu, but they were out of dessert (biscotti). We asked for a substitution and were able to have another dessert that we split in 2. That was a satisfactory deal. The food was excellent, but seating in front of the kitchen was extremely noisy, although the restaurant was practically empty. Food was great, but service was VERY slow. Meal took almost 2hrs. Out of character for this place. I've been to Ferro quite a few times and always enjoyed it. That's why I was so surprised by our experience this past Saturday. Our waiter got our orders mixed up, and then left our plates in front of us for about a half hour after we were finished eating. He seemed to completely forget about us, even though the place was pretty much empty at that point. Even worse, when we flagged down another server to try to order some coffee, she gave off a very annoyed vibe, as though we were bothering her. I'd say our lunch took about an hour longer than it would have if we'd had a more attentive server. I like Ferro and I'll definitely come back, but these two servers were really quite bad. The food was excellent. We were a large group and sat at the front. It was annoying when the door kept opening as it was cold. And people were standing waiting for the table. But in fairness, they did call to warn me before making the reservation. We would go back. But would sit further in the Reataurant. Haven’t been here in a while but is was good as ever!! Great food & really happy staff!! Will definitely become a regular again! Great food and fast service!!!! to be attentive and on time at peak dinner time. Thankfully food is always amazing. Their food is to die for. A must go for those not only seeking great Italian cuisine, but just amazing food in general. Their Mushroom Risotto is legit. Love this place, would go back everday if i had the money! The Italian food was terrific mushroom appetizer was excellent. The problem was one of our party is 4 years old and if this is a family restaurant it needs to have a childrens menu which it doesn't. There was also a 45 minute wait between ordering our food and recieving the main course which is unacceptable especially if you have a young one with you. I think that the stafff forgot our order? Too bad for the food was excellent. Won't repeat with kids. First time trying this restaurant and we weren't disappointed. Food and service were excellent. I would highly recommend. enjoyed a great meal that was not overpriced. loved the atmosphere. would definitely go back. Very Nice meal. I was disappointed that our reservation time the restaurant received was wrong. A table was not ready,fortunately, the time we arrived was after the regular dinner hour and the staff were able to scramble to prepare an open table. The reservation time the restaurant had on their "Tablet" device was for the time I placed the request with Open Table. (3 hours earlier), I wonder if this mistake has caused problems for others? Hopefully this glitch can be corrected. Great for family gathering. The mushrooms are to die for. Everything is amazing. I love the pizza with crispy pork cheek. It's quite different and very tasty. Creme brûlée......that's all I have to say!! The best. Food is good and good value. Service is inconsistent.